We’ll remember 2015 as an impressive year for backhoes breaking new ground; a few are documented in this awards section. 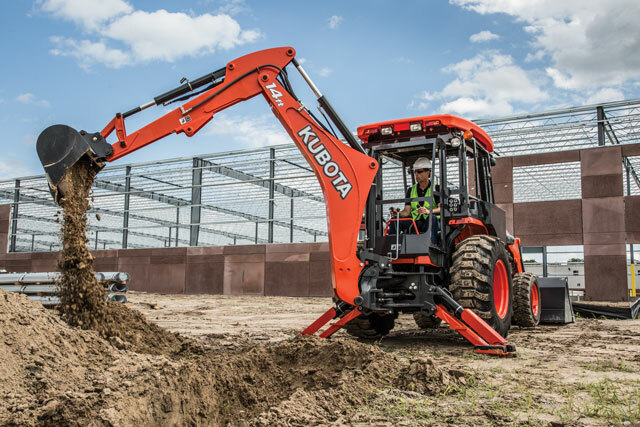 Global equipment innovator Kubota introduced two new four-wheel drive loader and landscaper utility tractors, the L47 and M62, available as either tractor loaders (TL) or tractor loader backhoes (TLB). These units redefine size and reach in a backhoe. The M62 specifically offers a whopping 14-ft digging capability (the industry standard), in one of the smallest utility tractor frames we’ve ever seen. It’s an excellent choice for customers looking to upgrade their backhoe performance, while still benefiting from a smaller TLB machine. Both new models offer more horsepower than ever before, with more versatility and an improved operator experience for landscaping to construction jobs. Fuel tank capacity has greatly improved on both new models, with the L47 and M62 each offering a 17.7 gallon tank, which is 22 to 49 percent more capacity than the previous models. Also awesome: On the M62, the newly designed quick-coupler allows compatibility with certain Kubota excavator buckets, making it more economical and versatile on the jobsite.